I retired in Jul2004 with last pay rs 7700. Pay scale s12 in 5th Cpc.with effect from 1.1.2016 I am drawing pension rs 24500.now grade pay revised to rs 4600 in place of rs 4200 as per dop &ow on dated 4 Jan 2019.what will be my revised pension as 4 Jan on? For this you have contact your ex-employer he only calculate the arrears of Rs.200/- pension (Rs.4600-4200=400 50% 0f pension Rs.200/-) from 1/1/2006 to 2016 Rs.200 plus D.R. p.m. for 10 years & as per the Matrix Level 7 fixed by your pension from 1/1/2016 to until settlement. arrears for 12 years approximately will be calculated and checked by PAO and given through your pension paying bank. I have been retired from Health department on 30/6/2008. My Joining was 05/06/1969 for the post of MPHW(Male). In 01/04/1979 I was drawn pay 420 rs in the scale of 410-660. 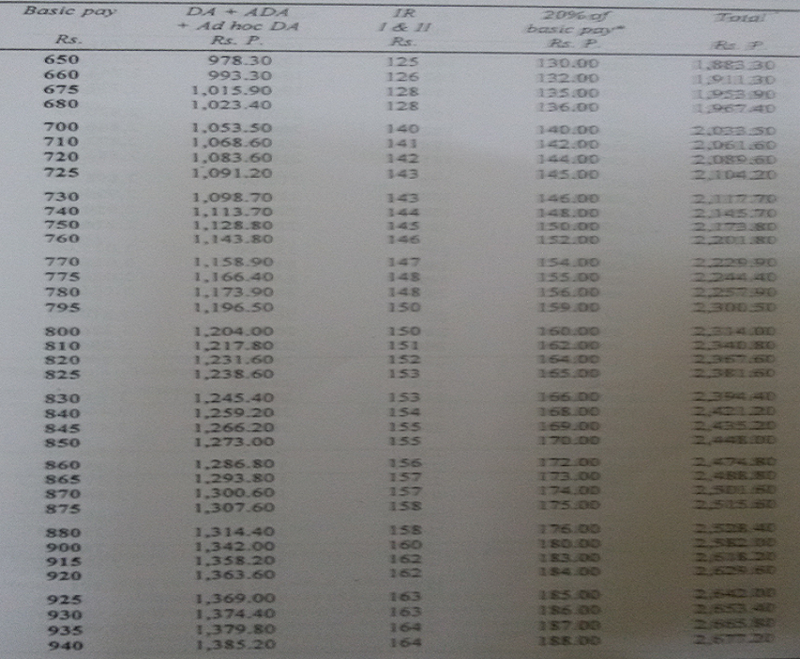 In this pay fixation my adhoc relief of rupees 18 rupees 50 Paisse was not included in my pay fixation. According to Supreme Court order CWP No 30613 of 2018 V/s State of Haryana & Others. Now the adhoc relief is to be merged in my pay when the pay is to be refixed. Kindly calculate my pay fixation w.e.f. 01/04/1979 to 30/06/2008. and a fresh copy of the pay fixation, fixed by you, may please be issued to me in my Email and oblige. Your pay was fixed in 5th CPC as scale 3,050-75-3950-80-4590,in 6th CPC as 5200-20200 with GP 1900 & in 7th CPC as Matrix Level 2 (19900-63200),, & in 7th CPC revised pension as on 1/1/2016 as Rs.12.600/-., It was rounded to 1350 (950-20-1150-25-1400) now revised as Rs.12,600/-. If you have attained 80 addition pension of 20%, if 85 years 30%, if 90 years 40%, if 95 years 50% and if 100 years 100%. Plus Dearness Relief as applicable time to time for pension with addition pension. D.R.. now from 1/1/2019 is 12%. I took voluntary retirement from railway on 17.3.85. Length of service 27 yrs. basic pay 960+40 (stagnation allowance); in the scale of pay- 650-960. My pension originally sanctioned was 580/-app. (I exactly don’t remember remember). What would be my notional pay & subsequent pension w.e.f 01. 01 86 ?